According to sources in Minnesota, the Blackhawks will soon announce that they have agreed to an entry-level deal with defenseman Nick Leddy. Leddy was one of the most impressive players at the prospect camp earlier this summer, and will reportedly begin the year in Rockford, leaving the University of Minnesota. A source indicated that Minnesota coach Don Lucia told an alumni function on Tuesday that Leddy would leave the Gophers to go pro with the Hawks. 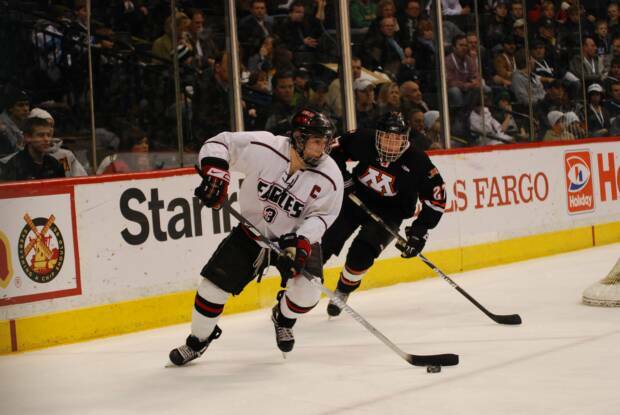 Leddy was named the Gophers’ Rookie of the Year last season and led the team with a +6 rating. He played on the Gophers top defensive pair yet committed only two minor penalties. Chris Kuc of the Chicago Tribune is reporting Tuesday evening that the deal is for three years and $2.7M. Leddy, the 16th overall selection in the 2009 Draft, was acquired with Kim Johnsson for Cam Barker early last year. He is rated as the number one prospect in the Blackhawks organization by CommittedIndians. He missed a good part of his freshman season at Minnesota after breaking his jaw on Oct. 30, but looked exceptional while skating with Shawn Lalonde at the prospect camp in Chicago. I can’t find the list of top prospects you refer to that shows Leddy as #1. Link?